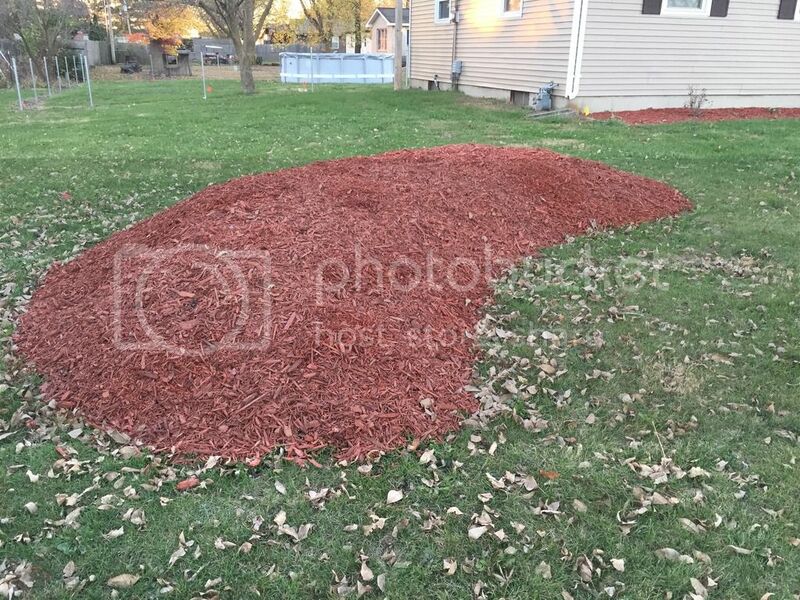 I'm putting a landscape mound in my front yard. 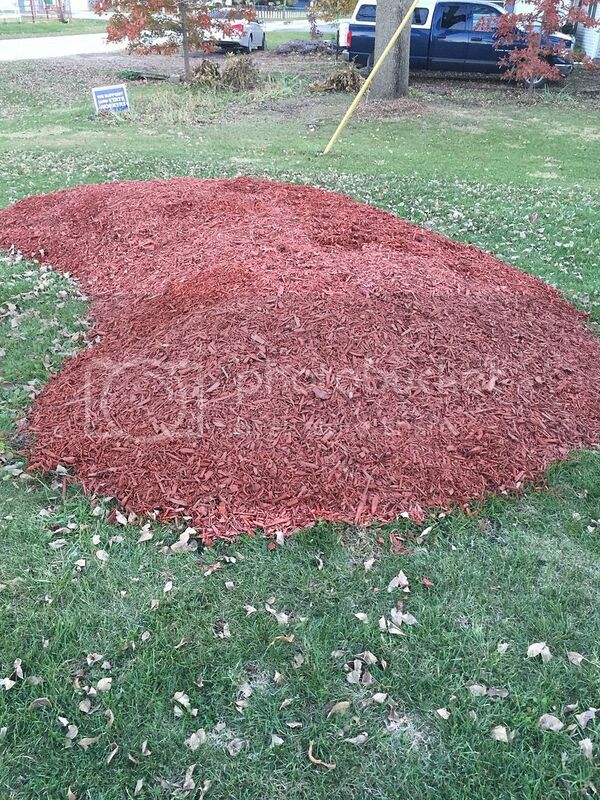 I have it shaped and mulched. But, I'm looking for ideas on what to plant. I won't be planting until spring so I have plenty of time to select exactly what my wife and I like. Here's what I'm considering. One possibly two ornamental trees. Preferably of a flowering variety. Then filling in with perennials. The area is in full sun. I tried to upload an image of the area from my iPad but it's telling me the file is too big. 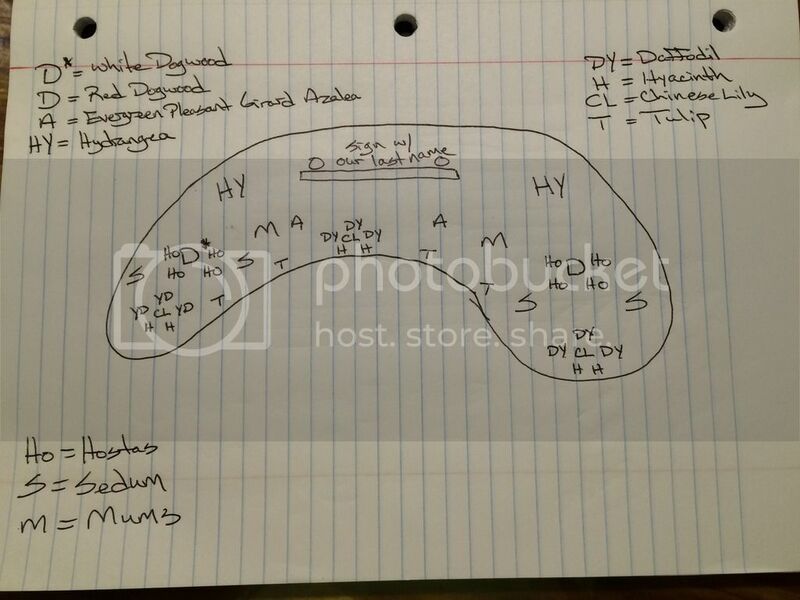 So, I am estimating the area is 8' by 20' and is shaped like a kidney bean. Re: Planting suggestions for front yard landscape mound? I am planning to put in a very similar berm in my front yard in the spring. How tall is yours at the highest? Is it just built out of soil or are the underneath layers different? As a general suggestion, I would think you want a more stepped down/ layered effect. In other words, not just trees and perennials, but trees, shrubs, and perennials, gradually stepping down the sizes. note how this steps down from the very tall trees in the back to shorter trees, to tall shrubs, short shrubs, perennials, and then some very low growing things in the front. Obviously neither you or I have the space to have very tall/ big trees like that, but you can scale this idea down. If there are trees behind you somewhere, in the view, you can sometimes "borrow" the view of someone else's trees, to be a backdrop for yours, or use a fence or building for a back drop. Or just scale the whole thing down. Note also the use of foliage color, some evergreen, some deciduous, different shapes and textures. Very true! I over looked the importance of such. I am in central Illinois USA. you can upload your picture to photo bucket and then it will be able to be pasted onto this forum. The landscape mound should have some variation in height and texture in leaf and some color. You also need to assess how it is going to be viewed. A bed that is up against a house or wall is only viewed from one side, but a mound in the middle of the lawn is an island bed which can have up to a 360 degree view, so you want to balance the plantings so it looks good from all sides. Other things to consider will be style. Limit the pallette of color unless you are looking for a cottage garden style. Plantings should be scaled to the size of the other features and the house. A single story house will be dwarfed in time by Italian cypress. The house color also plays a part in the selection of color for the plants in the yard. When you create a landscape it needs to be able to work with other elements. Any part must still fit in with the theme of the whole. If the bed is for privacy, there are different considerations than a bed as a centerpiece. Depending on how much time you have, you might want to select more low maintenance plants and natives to start with. A bed with curves like a bean shape is smart since it is actually easier to get around than a bed with sharp corners. If you do plant trees, it is best not to plant it in the center but slightly off to the side, it just looks more natural that way. If this bed is not centered in the yard, but on one side of it, what balances the other side? 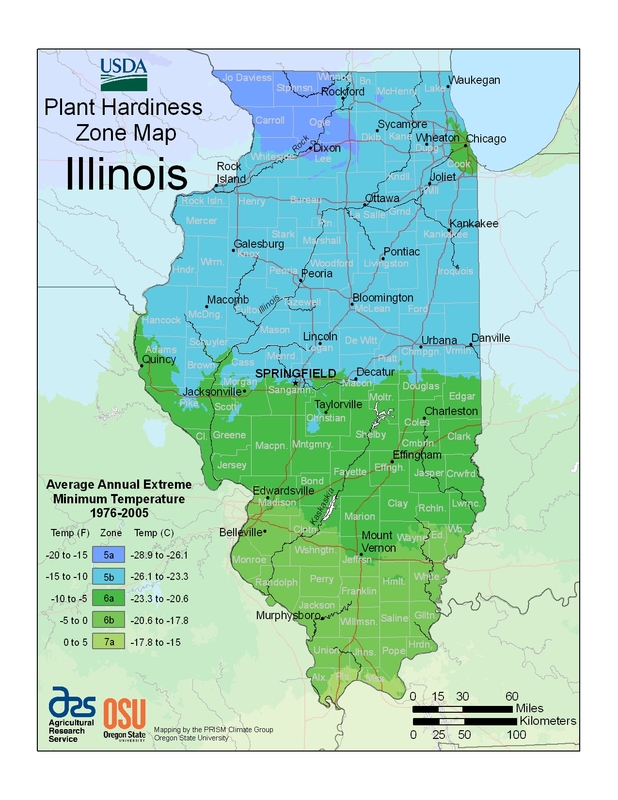 That just tells you how cold your winters typically get, so how cold hardy your plants need to be. Since plant roots are a bit more exposed on a berm, I would look for plants that are hardy to zone 5. Sorry I had missed where you said it is full sun. For your ornamental trees, I recommend serviceberry or viburnum. Both of them come in a variety of sizes including dwarf and both of them have berries that birds like. The serviceberry has edible berries, which you can make jelly of if the birds leave any and there are 40 different kinds of birds that like them. Viburnum is attractive to somewhat fewer kinds of birds, but it is still a good habitat plant AND its flowers are incredibly fragrant, perfume the whole yard while it is blooming. Both are kind of shrubby, but can be shaped as trees if you want. They are native, so will be very hardy and low maintenance, once established. For actual trees, redbud or dogwood are beautiful small trees. For foliage color, you can add a dwarf Japanese maple. Or for native small trees/large shrubs with colorful foliage, there is purple ninebark, black lace elderberry, smokebush. Or you could use 'wine and roses' weigela as a shrub to provide foliage color while stepping down in height. They say it gets 5' tall and 5' wide, but the one I had in a part shade location stayed smaller than that. And there is a more compact variety called 'fine wine' that stays under 4' tall. Red twig dogwood is a nice deciduous shrub for winter interest. After it drops its leaves, it shows bright red stems that are gorgeous in a snowy landscape. Artemisia (called white sage or silver sage) is a nice low shrub, that grows in a mound, and has silver leaves, that are a good contrast to other plants. It is aromatic, has medicinal uses, and is very tough and hardy. kalmia / mountain laurel is a much under used native broad leaf evergreen shrub, with beautiful flowers. The hybrid varieties come in a range of sizes from large-ish shrubs to very small. wayside gardens (waysidegardens.com) is one catalog that would carry many of these. Definitely not the cheapest place to buy from, but very high quality, well started plants. Hope this gave you some ideas to start with. I didn't say anything about perennials, because the trees and shrubs will give the structure to your new bed. After those are planted, you cans see what the space looks like and fill in with perennials. Have fun planning through the winter! Let us know what you decide on and how it looks! We love to see before-during-after pictures of garden projects. Thank you both for you're input and suggestions. I will do some research on the suggestions you've made. 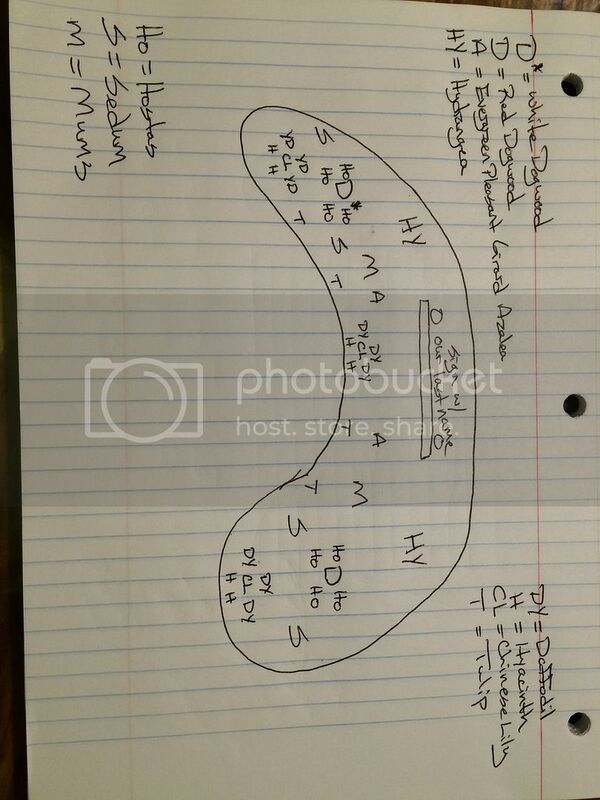 Our home faces east with the mound in the southeast corner of my front yard. I also have a bed in front of the southeast side of my house. That bed has 2 azalea bushes. Both were planted in the spring of 14. So, they are still very small but from what I read grow up to 6x6. I also have some Chinese lilies mixed in. Azaleas are a white/yellow bloom and lilies are yellow/red. Then on the north east side (facing north)I have 3 hydrangeas (2 are strawberry n cream which are cone shaped blooms pink/white and the 1 in the center is a standard white. There are two bushes in front of my hydrangeas but I don't recall what they are. Leaves are a greenish burgundy and they flower with pink blooms that are kind of flute shaped. On the north side of my yard I've recently planted 3 Cleveland select pears. All are saplings and only about 6' tall. All of my landscaping is recently planted either this year or spring of 14. The landscaping here was slim to none when we bought the home. So, I work on it when I can and add to it as finances allow. I'll open a photobucket account so I can post pics. But sure do wish I could just attach them from my iPad! For some reason every once in a while we have problems posting pictures too and it says the same thing, the file is too big. Using photobucket solves that problem. With spring finally here I've started on this project. So far here's where I am. I've planted 3 groups of the following Yellow Daffodil Qty. of 3 and Purple Hyacinth Qty of 2. For a total of 9 Daffodil's and 6 Hyacinth. I've put in a few tulip bulbs. For trees I've went with one Red Dogwood and one White Dogwood. So, I feel spring is covered as far as color and blooms go. So, my next question for you folks is what can I put in for a few summer and fall bloomers? I have a fall bloomer in mind but I don't know what it's called. I would explain it as a think stemmed and leaved plant that blooms in purple bunches in the fall. Traditional fall blooming perennials are asters and mums. The viburnum shrub I mentioned has berries in the fall and beautiful fall foliage color. Yarrow, anise hyssop, milkweed are native flowers that bloom from summer into fall and are attractive to butterflies and beneficial insects. Purple coneflower is another native and very long blooming, from spring into fall. If you need something tall, joe pye weed grows six feet tall or so, with large purplish flower clusters at the top and blooms from late summer into fall. Various of the sunflowers bloom into October or even Nov, including helenium, jerusalem artichoke, helianthus, heliopsis. Think about things with colored foliage. Blooms come and go, colored foliage is all season long. Plant your trees and shrubs first. That gives the structure. Then you can tell better where to plant anything else. Yep! Sedum is it! Thank you! Any thoughts on this lay out? I have the dogwoods, evergreen azaleas, tulips, Daffodil's and hyacinth already in. The rest is my initial idea and will need to be purchased. Looking good! Other than the mums, it is pretty much all spring bloomers. You do need a little more of the summer-fall stuff. I gave suggestions before. I like asters. I saw many berms last fall that looked beautiful with those. They seem like they are kind of a ground cover? At least the ones I looked at were all low to the ground and seemed to cover large areas with in the area. Am I right in thinking the hydrangea and Chinese lily will give me early summer/summer blooms? Need ideas/help, bush suggestions for front yard!